Jersey City History - Old Bergen - Chapter II. DISCOVERY OF THE REGION OF THE HUDSON. During the night a storm arose, and the wind blowing from the northeast, the vessel was driven on shore, but as the ground was soft sand and ooze, it was not harmed. . . . The people of the country came aboard of us, seeming very glad of our coming, and brought green tobacco and gave of it for knives and beads. . . . In the morning as soon as the day was light, the wind ceased and the flood came, so we heaved off our ship again in five fathoms of water. Some of the Indians came aboard of the vessel, but at night they were sent on shore as they were not to be trusted. The remainder reached the vessel in safety, bearing the dead body of their companion. The Indians now showed such an unfriendly disposition that a strict watch was maintained to guard against treachery. 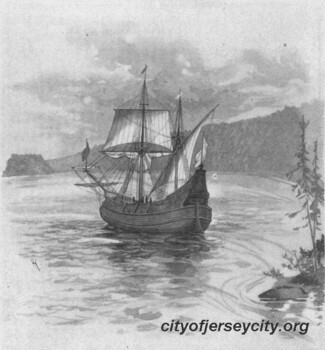 Determining from the investigations of the crew that the desired passage lay before him, Hudson weighed anchor,and from the 7th to the 13th the vessel slowly and cautiously worked its way through the bay to about Weehawken Cove, where he again anchored. We can scarcely appreciate the emotions of this bold navigator who, after many years of searching and stormy buffetings, found himself, as he supposed, on the threshold of a discovery that would revolutionize the trade of the then known world. Standing on the deck of his vessel on that autumnal morning, his eyes rested upon the fairest picture that ever sun shone upon. As he passed through the Narrows, he saw stretching out before him the glittering road that was to lead to fame and fortune. Surrounded by the wooded hills of Long and Staten Islands, with the rocky shores of New Jersey rising in the distance, the magnificent bay and river reached off to the northeast, as if beckoning him on to the long-sought-for goal. They go in deer-skins, loose and well dressed; they desire clothes and are civil; those from the east side were more fierce, while those from the west side, while we lay at anchor, brought for barter the largest and finest oysters, Indian corn and vegetables. The next morning, the 14th, Hudson commenced ascending the stream, but he soon discovered, from the shallowing of the water, that he had not succeeded in finding the northwest passage. He continued his investigations, however, reaching a point above Albany on the 23rd. Jouet states: "Higher up it becomes so shallow that small skiffs can with difficulty sail there, and one sees in the distance several lofty hills from whence most of the water in the river flows." Within a while after, we got down about two leagues beyond that place (Haverstraw Bay, author's note), and anchored in a Bay clear from all danger on the other side of the River. We here saw a good piece of ground, and hard by there was a cliff (Castle Point, author's note) that looked of the color of white green, as though it was either a copper or silver mine, and I think it to be one of these by the trees that grow upon it, for they are all burned and the other places are green grass. . . . There we saw no people to trouble us and rode quietly all night, but had much wind and rain. The 3rd was very stormy, and in the morning in a gust of wind and rain we drove on the ground, but it was oozy. We had much wind and rain, with thick weather, so we rode all night. The 4th being fair weather, we weighed anchor and came out of the great mouth of the great river that runneth to the northwest (junction of	Hackensack and Passaic Rivers, author's note), and by 12 o'clock we were clear of the inlet. On the 5th we continued our course toward England without seeing any land by the way. 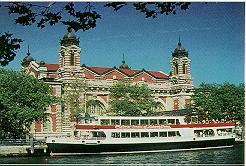 It is thus seen that Hudson left the harbor through the Kills, and passing around Staten Island, reached the ocean. 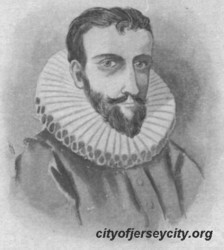 Although Hudson had failed in his endeavor to secure a short passage to the East, the knowledge that he had discovered a country of such boundless resources, doubtless reconciled him to his want of success.